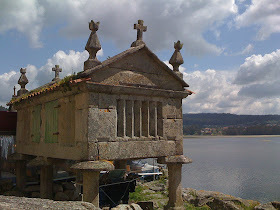 If you travel through north eastern Spain the chances are that you will see something like above structure, pictured in Ourense in Galicia. 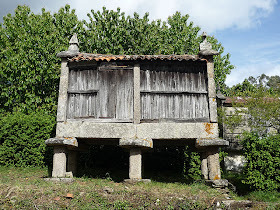 Known as hórreo and often centuries old, these structures served a vital purpose for the local communities. Can you guess what they were for? As European civilization spread so did problem solving technology. 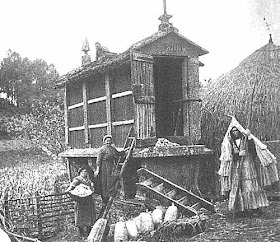 The hórreo was the answer to a particular issue – how to keep cobs of corn and other crops dry and safe from rodents before they were threshed. Although a simple solution it was one which persevered through two thousand years. 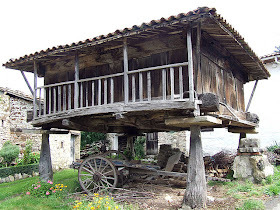 Although they have now been superseded, the hórreo of Spain are a reminder that a good idea can persist for a great deal of time. 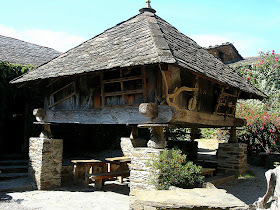 Although hórreo is the modern Spanish word, the constructions come with a variety of different names according o the local language or dialect with variations in places such as Asturia, Galicia and the Basque country. 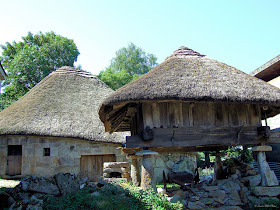 They will also come in a variety of permutations and combinations - some even have a thatched roof. Yet they all follow very similar means of construction. 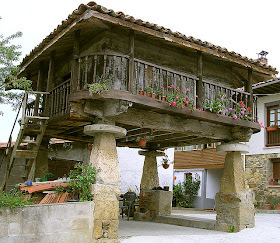 Common to them all is the manner in which the hórreo is raised from the ground by pillars. Yet the design is a little more complex than that. 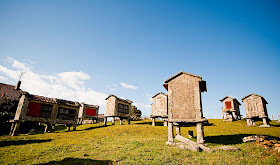 At the base of each is an enormous slab of stone which are known as pilpayos. 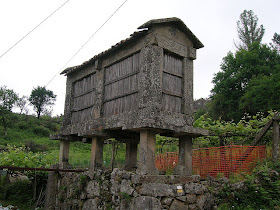 The legs of the hórreo stand upon this and are usually known as pegollos. On top of this is another huge stone which is called the muela. This combination of stone (or sometimes wood) is remarkably effective at keeping rodents at bay. 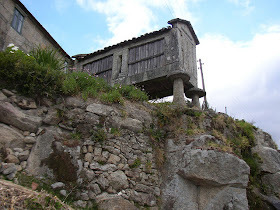 The hórreo is built above the muela, out of reach from the gnawing jaws and ravenous mouths of rats and mice. 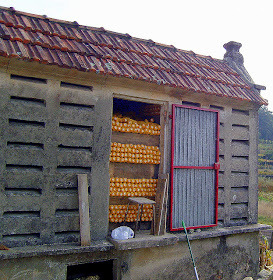 The sides are often slatted for increased ventilation to help keep the corn and other harvests dry. 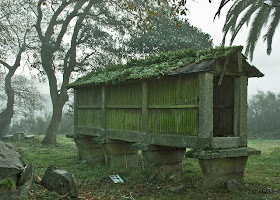 Many people think that the hórreo was a Roman invention and its use was spread around the empire as it expanded. 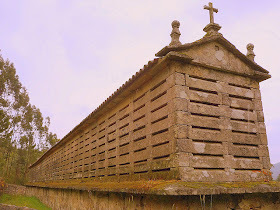 This is because the word hórreo derives from the Latin horreum. 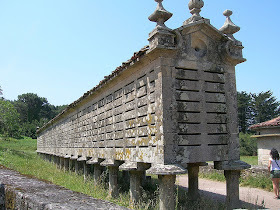 Yet according to Roman writers such as Strabonius the structure was not an invention of the empire. 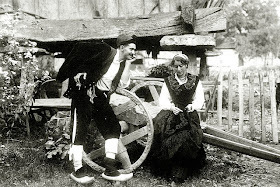 Anthropologists believe that they were originally Celtic in origin. 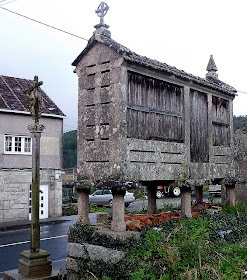 Anyone would be forgiven for thinking the hórreo a Roman invention. 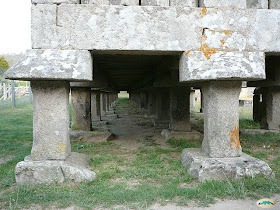 If you are familiar with the hypercaust system of furnace driven heating and ventilation built under many Roman villas there are striking similarities. 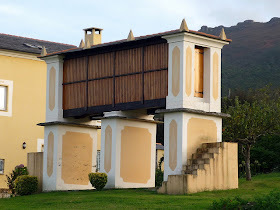 Whereas in a hypercaust heat would travel upwards, the hórreo structure was designed to keep things above cool. 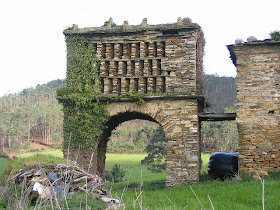 Hence a hypercaust was built under the ground, a hórreo above, exposed to the elements. 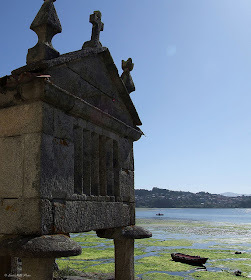 As you can see the shape of the hórreo differs, and this depends on the region. 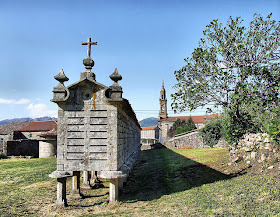 In Galicia and Asturia the hórreo is usually an extended rectangle. 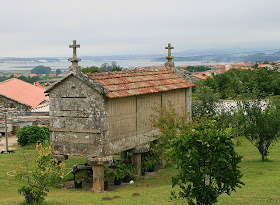 In Cantabria and Galicia they tend to be square. Although they were part of the landscape for hundreds of years before the first depiction in literature comes from the 12th century. 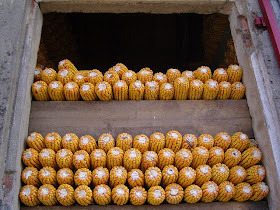 The length of the hórreo is dependent on how much corn the local area produced, so they can be anything from four meters to one which is an incredible 35 meters in Carnota (above). 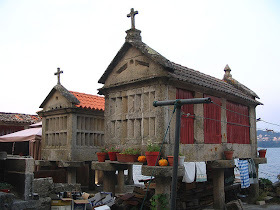 Although structures with similar if not identical purpose exist in other European countries, close like Portugal or as far afield as Norway, there are over 15,000 hórreo still in Spain, many more than anywhere else in Europe. 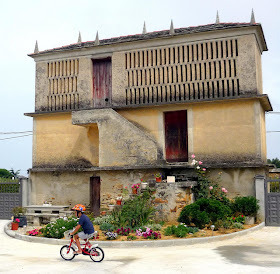 Many bear the idiosyncratic touches of the original builder and so vary from place to place. 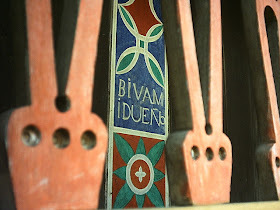 The one above bears the inscription Biva mi dueño. This tells anyone who might feel the need to use it as their own that My owner still lives. 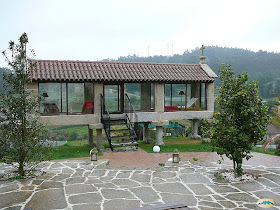 There even seems to be a variety that could be classified as the luxury or even multi-story hórreo. 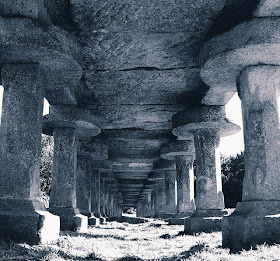 This amply demonstrates that these structures were used by all strata of society, rich and poor. 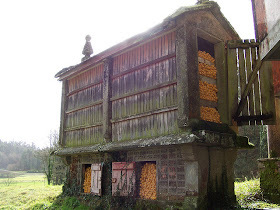 Today very few are used to store crops, such as the ones above, loaded with corn in Ames and Boiro, A Coruña. 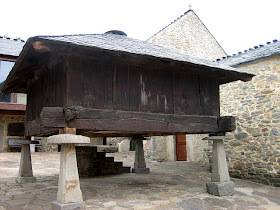 Often firewood is often kept inside them so that at least retain a useful purpose. 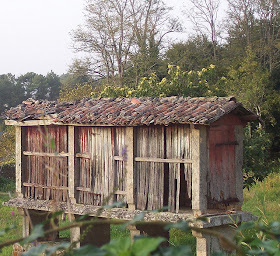 They are also used to store the occasionally needed paraphernalia of the household which owns them but many have become unused and derelict, if still in one piece. 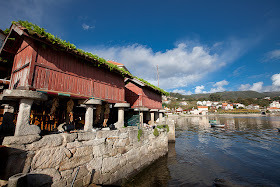 Why have the hórreo stayed intact for so long? It was in the best interests of the owners to keep them in excellent condition. 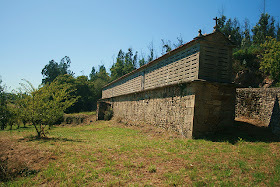 Their structure, often stone but regularly wood, is sturdy enough to last for hundreds of years if maintained properly. Their disuse has gone hand in hand with the industrialization of agriculture in the twentieth century. 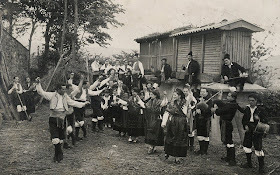 Yet there is much photographic evidence to show the hórreo was still used well in to the age of photography – as much by their excellent condition as by anything else. Yet some pictures do show them being used for their original purpose. Quite what the original builders would have made of some twenty first century adaptations, however, is a matter of pure debate. 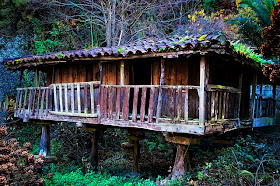 Although many of the thousands still extant have become derelict there is a growing realization that they should be preserved. Yet there are so many thousand that it is inevitable that some will be lost along the way. 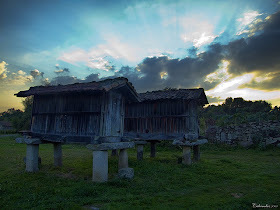 A number of them have been restored and stand proudly as monuments to hard working ancestors. 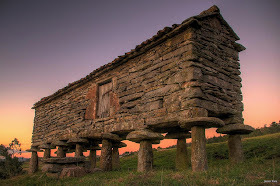 They are an important part of the Spanish landscape and represent an almost unrivalled continuity in terms of human built structures.